Ferns have a way of holding onto bits of their color during even the coldest months. Not that the plants are actively growing then, but a lot of their aerial parts don’t totally die back in the winter. In the Northeastern United States we experience four seasons and right now it’s still officially Winter. Yeah, it looks kind of bleak out there in nature, at least when you’re looking at the big picture. A lot of the grass, and weeds!, in lawns and near roadways appeared light green to tan or brown before the big snow arrived. The green parts will reappear when the weather gets sunnier and warmer and that’s actually not too far away now that it’s March, which came in like a lamb here in Central PA.
Greens polka-dot the landscape where the pine trees and hemlocks and other evergreen trees grow, but zoom in a little bit and you can find more splotches of color. Taking a walk in the woods you can find ferns holding on to their leaves from the past growing season. 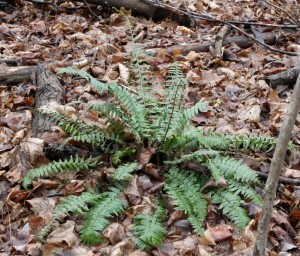 Large fern found singly. Long arching leaves with rounded leaflets. 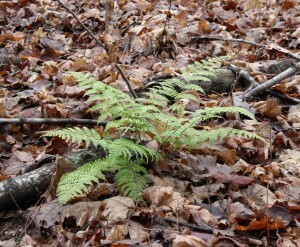 Small upright fern. Few leaves in vertical arrangement. Leaflets twist up the stems. 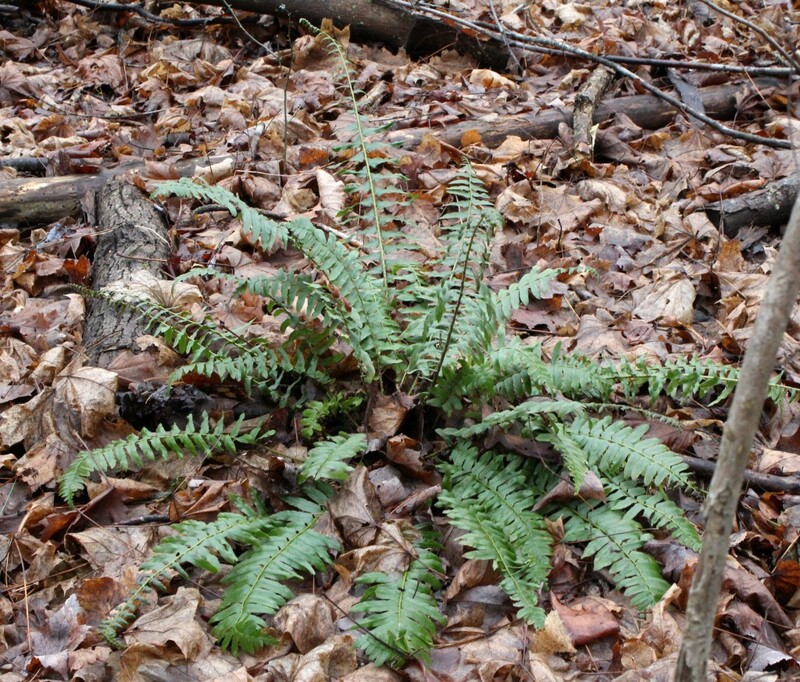 Medium size light green fern often found in mass groupings. Erect leaves with etched leaflets. So, how do we tell what fern it is? The one I’ll use for wildeherb identifications is Fern Finder by Ann and Barbara Hallowell . It’s a small, 64-page pocket guide that is excellent at what it does and that’s teach us about ferns and how to identify them. 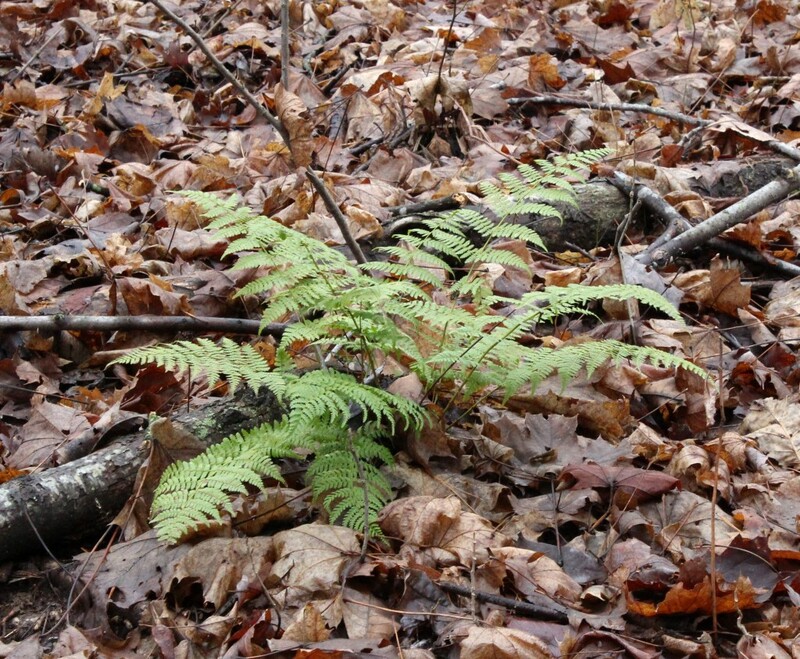 Fern Finder concentrates on the ferns of Central and Northeastern United States and Eastern Canada, so if you live in the American West or Deep South, you may have to look for additional resources to identify your ferns. Maybe you took notice that I’ve used terms that apply to flowering plants to describe these generic ferns above. How astute! Ferns are quite different from the angiosperms or flowering plants so it doesn’t follow that the same terms apply equally to flowers and ferns. Instead of saying leaf we should use the term frond when speaking of ferns. Likewise, instead of leaflet we should say pinna. Other features of fronds are used to identify the species, such as the overall shape of a frond and how it’s divided into pinna. Of course some ferns aren’t divided into pinnae, which is the plural of pinna. The fern’s growth form is an important clarifier, as are the appearance of the pinnae and the frond stems. Ferns don’t have flowers as such, but their reproductive parts can also be used to help identify the species. We talking about rhizomes or underground stems, spores that are found on the undersides of leafy parts of the fronds, and bulblets. Since I couldn’t identify them, how did I know they were ferns? I’m not sure, I just knew they were ferns. Kind of like just knowing it’s a robin red-breast when you see one hopping around the yard. As kids we were taught things by others pointing and saying the name of the new thing. We grow up learning the names before we understand the thing. Next on my list is to go find my lil standup fern and photograph it. Then we can begin to compare the three ferns more meaningfully.